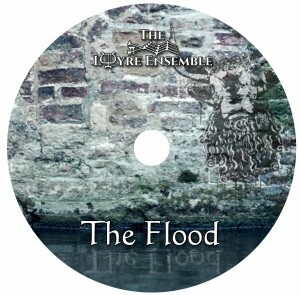 The Flood is the first ever full-length album of cutting-edge new music in Babylonian and Sumerian, accompanied by reconstructed ancient instruments. Stef Conner, Andy Lowings and Mark Harmer formed the Lyre Ensemble because they shared a passion for the rich and fascinating corpus of Mesopotamian literature, as well as a desire to make music using reconstructions of beautiful ancient instruments, and a belief that new music is a powerful tool that can be used to forge empathetic connections between people in the modern world and voices from the deep past. When they came together to make the album, none of the group had a precise plan or firm idea of what to expect from the collaboration – they just met in a little medieval church near Andy’s house, with a collection of ancient lyres, a box of random resonant metal objects, some Mesopotamian poems and a stack of recording equipment, and started to improvise! By the time the album was recorded, everyone involved was surprised and somewhat awed by what they had collectively created. The incredible Mesopotamian poems and beautiful Gold Lyre of Ur have inspired some of the strangest, rawest and most gripping, otherworldly songs you will ever hear, as well as some fun, amusing and often downright bizarre little excursions into the ancient Mesopotamian world, which reveal that in many ways, people in the remotest of ancient civilisations were actually a lot like us! You can order your copy of The Flood now to receive the full album + a booklet with English translations of all the Mesopotamian texts used. We ship anywhere in the world. For a preview of the music on the album, you can listen to its title track, which is embedded below. The text sung on this track is taken from the Babylonian Epic of Gilgamesh and tells the story of a great flood, sent by Mesopotamian deities to engulf the earth. There is also a mini-documentary about the album available online, including translations of some of the texts, more sample sounds, footage from recording sessions and interviews with Stef and Andy. Enjoy!